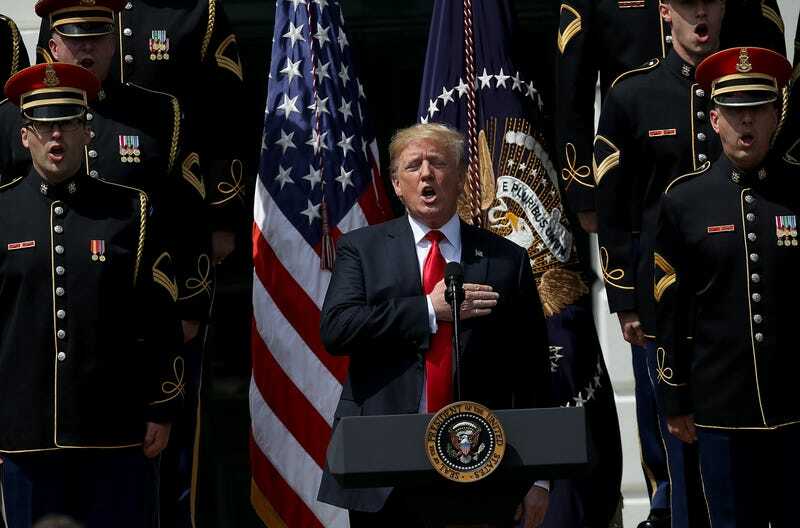 President Donald Trump at the “Celebration of America” event on the South Lawn of the White House on June 5, 2018, in Washington, D.C. If this were a movie, you would have walked out of the theater by now. The glorious moment of irony, which will be lost on racist supporters who don’t care that the president knows all of the words to the Russian national anthem (OK, he probably doesn’t know all of the words to the Russian national anthem), was caught and immortalized on social media. And I guess it doesn’t matter that his whole “Celebration of America” was based on a mountain of mistruths. The first was that the president was disinviting the Eagles because of players’ refusal to stand for the anthem. The truth is that not one Eagles player knelt during the season, but that didn’t stop Fox News from running a photo of players praying to help the president drive home his point—a move so manipulative that the station that pushes propaganda had to actually issue an apology. It also doesn’t matter that photos of said “Celebration of America” were blindingly white—a sea of Croc wearers and AppleCare-manager seekers assembled at the White House to protest color in America—because that’s always what’s at the core of this president’s divisive presidency.